This is not all that helpful. I have a bunch of files I’ve created over the years in various flavors of Microsoft Office. Some of them are old articles or even attempts at fiction that I abandoned, but became curious about them. Imagine my surprise when Microsoft Word refused to open them, generating the somewhat incoherent error you see on the left. Apparently, Microsoft wants to protect me from myself. At one level, I understand this. Microsoft Office became victim to various malware authors, using Office’s built in Visual Basic for Applications, or VBA for short. VBA makes life easier for heavy office users, allowing them to script frequently used repetitive actions. Some VBA applications for Excel in particular border on independent applications, including games you play entirely in Excel. That’s all well and good, but give a malware author a relatively sophisticated way to access the internals of a major applications, and you’re asking for trouble. Vulnerabilities in Office itself doesn’t help matters. So Microsoft has tried to tighten security with each version of Microsoft Office. The problem lies when people who upgrade want to use old files, then discover that Microsoft is “protecting” them from their own files. That’s all well and good, but Word 365 gives you no clean way to convert or import files in older formats. Looks straightforward enough, but it’s a trap! Sure you can. You get to the file block settings by the process of clicking file –> options –> trust center settings –> file block settings. This tedious bit of clicking brings up the screen you see on the right. At first blush, this appears reasonably straightforward. Select the document types you want to open and edit. 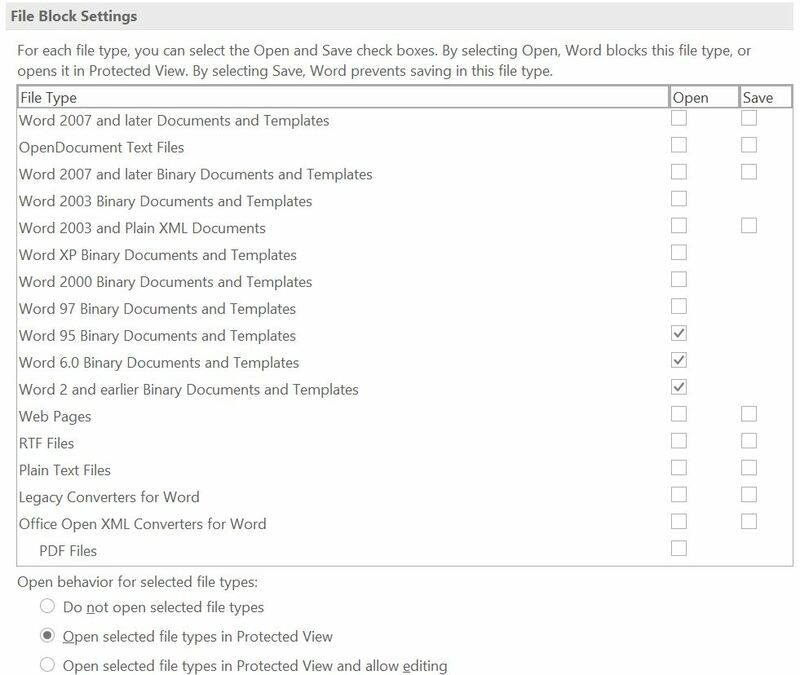 The file block settings page even allows you to open and edit. Nifty, huh? Well, it’s pretty nifty, except it doesn’t behave consistently. I know, I know, you’re shocked that a Microsoft applications demonstrates inconsistent behavior. For example, if I enable all the Microsoft Word-specific options, all the way back to Word 2 and earlier, I can now open said files. However, I cannot save these files in the latest .docx format even if I enable the save or allow editing options. I can understand not wanting to save the file in an archaic format, but I can’t even save in the current format. In fact, I can’t even save a Word 365 file any longer. Returning to the default settings thankfully enables the ability to once again open and edit .docx files. Bug? Feature? Poor UI? Pick your poison, it’s all irritating. In the end, I enabled all the options, opened the documents successfully. I couldn’t save them, but I could paste them into a Google Doc file, then export that to a Word file. I installed OpenOffice, which opened the few remaining that I couldn’t get Word 365 to open enough to copy and paste. Through this convoluted combination of messing around with file block settings, copying to Google Docs, and using OpenOffice, I’ve successfully rescued those old files. I still have a boatload of old Word docs leftover from my days writing for Computer Gaming World, and I’m wondering if it’s worth rescuing those files. I can’t be the only person with a trove of old Word files, so take heed. If you have old Microsoft Office files, you may want to update the file formats, before Microsoft no longer allows it. This isn’t the first time this sort of thing has happened — recall the kerfuffle around Word 2010, and how that application couldn’t open older files. Microsoft needed to issue a patch with conversion options to address the outcry. You think Microsoft would have learned. You would be wrong, once again.